Here we are. already halfway over September. Fall is just around the corner and new colors are coming out every day. This fall, Bare Escentuals has three new Ready 8.0 eyeshadow palettes, and I’m so excited about them! I really love the Ready Eyeshadows, and this year’s 8.0s have all new colors. For 2012, three 8.0s will be issued. The first 8.0 was The September Issue, a Sephora Exclusive, and you cannot find it in other stores. The 2012 releases are in limited edition silver palettes, with 8 color packed fullsized shadows inside. You may remember that last year the Cocktail Hour and the Playlist, two 8.0 Limited Edition palettes in gold compacts. While these are still around in stores, they were intended to be limited edition like this year. As with the other Ready Eyeshadows, BareMinerals READY Eyeshadow combines BareMinerals’ proprietary SeaNutritive Mineral™ Complex with powerful antioxidants, cold-pressed borage oil, caffeine, and cucumber—ingredients known to deliver antiaging benefits including reduced appearance of puffiness and antioxidant protection for a softer, smoother, revitalized eye area. The formula looks like a powder but feels like a cream and delivers a beautifully smooth application of vivid, long-wearing color. This fashion-forward palette of jeweled forest and floral shades delivers this season’s standout looks. Learn how to create three on-trend looks, then mix, match, and experiment for endless effects. Couture (glimmering clove), Silhouette (antique white), Statement (vibrant orchid), Prêt-à-Porter (sunbaked gold), Três Chic (apricot cream), Editor’s Pick (metallic teal), Glitterati (shimmering pink), Ensemble (deepest eggplant). These are all full size .28 oz shadows with high impact color and pigmentation. I really love this palette because it has a color punch for fall. There is something for everyone in this group of shadows, from neutral golds and peaches to dark teal and purple. The last two can be used as liners easily, and with the included brush it’s a great little kit. The Ready Eyeshadows do not contain parabens, phthalates, petro chemicals or other ickies, but for those of you who are sensitive to Carmine please be aware that several colors do contain this coloring agent. Carmine can be controversial as it is derived from the shells of beetles, and many people have allergies to this ingredient. Ready eyeshadows also contain Bismuth Oxychloride. While I don’t have a problem with it, many people are sensitive to this ingredient which can cause itching. However, because there is so little in the eyeshadows, I urge you to try them before making a judgement. These colors are all new, and the only similar shades that is a possible dupe is Prêt-à-Porter ;; it is however, much more bronze than gold and is not an exact match. I love this palette, and for $40, it’s worth every penny! If you wait for the Sephora Friends & Family sale, you can save even more! Coming full circle. Giggling with friends. Learning from an expert. These are all things that make me feel fufilled, and happy. I started this blog after being inspired by attending a BE Master Class a year and a half ago. Up until then, I rarely wore makeup, and I always struggled with keeping my eye makeup on my eyes and not on my chin. I was one frustrated woman! I had been trying new things, and collecting a BE stash for about six months when I saw that an expert was going to be in my area teaching a class on makeup. As an early birthday present to myself, I decided that I was going to attend, and see if I could learn some new tricks. Boy did I ever! Since then, I have become a Sparkle Hoarder, and proud of it! Here we are, 16 months later, and I was fortunate enough to attend my third Bare Escentuals Master Class, with Master Makeup Artist Bravon Pascua. Bravon, who spend years as a model all over the world, has been working with Bare Escentuals for over 10 years. He has seen the brand grow from a few shades of mineral foundation to the phenomenon it is today. Learning from makeup luminaries like the creators of Shu Umuri, he has taken education to a new level. As I mentioned, this was my third master class with Bravon, and I feel like I learn something new every time. I would go every month if I could afford it and if Bare Escentuals offered the option! At this particular class, the focus was on creating a bronzey, summery glowing look using some of the Ready offerings. This class was extra special for me, as we only had 8-9 beauties. It was extremely intimate, and a very unique experience. My two previous classes were wonderful, but there is something extra special about being in a tight knit group of women, sharing, learning and exchanging makeup tips and tricks. First, after cleansing your face, add your moisturizer of choice. Bravon recommends warming your moisturizer up in the palm of you hand first – which allows it to sink in to your skin more quickly. Once your moisturizer is applied, it’s time for face primer. I personally love the Neutralizing Primer but you can use whatever works. Again, make sure you warm it up in the palm of your hand before applying so it really covers. I won’t tell you how to apply your foundation, because if you’re a BE gal you know! Swirl, tap, buff. Just remember a very little bit goes a long way. Because BE works with your natural body chemistry and the oils in your skin, the more you buff the better you look. One key tip here is to start with a little. Wait 10 minute and then, ONLY then do you apply another layer. It’s amazing to watch, but you can see the transformation as you watch a makeunder. When you’re applying your concealer, you should always post conceal with minerals. If you pre-conceal, you will buff off the concealer while applying foundation. I stopped using bisque because it seemed to settle in my lines and look cakey, but I learned that using a Light Stroke brush really makes a difference. Swirl the bisque in to the brush, and pat on. Then flip the brush over and use the clean side to sweep and blend. After foundation (or before, if you’re like me), it’s time for the eyes! One key element in doing your eye makeup is defining your shape. If you’re like me, I have hooded eyes and it’s very ahrd to see the lid. bravon gave some excellent tips for combating this. First, start with your primer. Using a brush or your finger, apply eye primer all over your lid, lash to brow.. But also, apply primer over your brows, and to just above your eyebrows. This gives you a smooth canvas to work with, but also something for the eyeshadow to adhere to. I’ll get ot the above the brows in a minute. For this eye look Bravon used The Soundtrack Ready Palette, which contains Rhythm, Louder, Remix and Speaker Box. These colors are available in the The Playlist 8.0 so if you already have it you’re nearly there! Rhythm is the only one that is a new color here, and you can easily approximate that, as it’s a light cream color. For this look, start by taking a light bronzer. In this case, Skinny Dip. Using a soft focus eye brush, or a crease defining brush, enhance the crease with the bronzer. It’s amazing that this one small trick actually makes a huge difference. This contouring technique will create a deeper crease and make the color pop more. This helps hooded and small eyes because it creates the illusion of a larger eye by redfining the natural crease. Next, using your favorite larger brush (he used a full tapered shadow brush), apply the highlight color from the base of the last to the crease. You will also apply this color above the eyebrows – this is why a primer there helps. this helps to open up your eye and give you a wide awake look. Colors like vanilla Sugar, Soul, Cream Soda and Queen Phyllis Matte were suggested. Don’t use a super sparkly color here though, since that will attract too much attention to the area and distract from other areas. For this class we used Rhythm. For the crease, using the crease defining brush, feather the color up instead of sideways. that means flipping the brush vertically instead of horizontally, and applying Louder up to the crease, but not beyond. This gives the eyes a pop of light color. In the outer V of the eye, sweep Speaker Box using the precision eye brush, or a small pointed one. Then use a brush to soften and blend that out. Now that your eyes are done, it’s time to add the eyeliner! The best tip that I learned from a National Artist last year, since I had huge troubles with the Big & Bright liners travelling, is to sketch the liner on your hand first. Make this a pretty heavy sketch, but then use an eyeliner brush to pick up the color. In the case of the B&B liners, I dipped my brush in Weather Everything. With the Round the Clock liners, you don’t need to do this since they set up on thier own. Apply the 8ppm liner to your upper lashline, and smudge in to your lower lashline. Don’t forget to do your brows! The primer you applied earlier will help the color to stick. you can also use a clear brow gel. Finally, you apply your favorite mascara and you have defined eyes to die for! But, wait! There’s more! The hot trend for fall is full, glossy and sparkly lashes. How do you get this? Start by applying a coat of regular mascara. But then, using a clean disposable mascara wand and a clear brow gel, dip the wand in the gel, then dip in your favorite sparkly minerals. this is a lot of fun for a special look and you can really use any color. Glittery reds and greens are going to be right on trend for holiday! If you just put the clear coat on top, you will have glossy and lush lashes. Now that your eyes are done, we can go back and review the foundation. Is it still looking good? Better? If you need to, apply another layer. But, let’s define your face using bronzer and blush. With an angled face brush, use the bronzer in a sweeping motion. Point the tip up, and sweep the bronzer over your cheeks. This actually deposits color just above and blow the apples of the cheeks, giving you great definition. You can also do this on your forehead, and jawline, with the tip of the brush up. Taking your faovrite blush (we used The Aphrodisiac), swirl the color in to the apples of your cheeks, sweeping up to the hairline. Then take a Maximum Coverage Foundation brush and pull the color down in to your face. It sounds odd, but it really blends the color in nicely. Finally, apply your favorite lip colors and don’t be afraid to blend! I’m sorry to say I forgot my camera but the finished look is a soft and polished summer look that is great for anyone. I can’t wait to practice these tips and learn new ones at the next class! Thank you Bravon for always teaching this old dog new tricks and reminding me that there are so many ways to use brushes and products. I hope Bare Escentuals will continue these classes and add new ones! Bravon is a master artist but is also a passionate brand ambassador. He loves to play as much as we do, and is a fabulous teacher, and has a heart of gold. He will go out of his way to answer questions or offer suggestions for your specific issues. If you have a chance to attend a master class, I would not miss it! You never know what might happen. Stay tuned to looks based on these tips! I’m feeling well rested at last! Have you been sleeping lately? Well, no, me neither. Life’s little stressors, insomnia, work, all the things that get to us – or even sometimes just your body’s natural chemistry or genetic luck of the draw, sometimes we need help to hide those dark circles. There are dozens of brighteners and highlighters out there, but the best of them actually counteracts the blue black color of those shadows. Bare Minerals makes one of the better products out there, a loose mineral powder called Well Rested. Well Rested, in the original loose form, is a creamy mineral powder with a pale buttery yellow color. The yellow counteracts the blue, and brightens up those dark places. Unfortunately, if you’re like me and you’re getting a touch long int he tooth, or if you have dry skin, the loose minerals can tend to settle in the cracks and creases adn make the under eye area loose crepey and wrinkled. No thanks! Thank goodness the team at BE has coem up with a fantastic solution! Well rested now comes in a creamy liquid form, in the now iconic (from other manufacturers) pen. This new formula is translucent but still has the yellow tone which is important for counteracting dark areas. The creamy liquid is a blend of mineral powders, as well as antioxidents like Vitamin E, which brightens, lightens, and treats those areas. You can use it before your mineral foundation, or after your liquid foundation to illuminate areas you want to highlight. The benefit of the pen format is that you can reapply at any time during the day for a little boost. Keep in mind this is not a concealer. If you have serious darkness, or problem areas, you will need to use a concealer in addition to the brightener. I also own Touche Veloutee, which is a brightening concealer. While not as natural as Well Rested, that product is truly a concealer. Well Rested is intended as a brightener only and not to provide full coverage. Well Rested has no shimmer so it’s a great way to subtly highlight and is half the cost of any other similar product. The Well Rested Face & Eye Brightener is available at QVC. 1 fluid ounce is $22. Since a little goes a long way, this should last you a while. Merry Christmas! Well ok, it’s a tad early for that, but since all of the holiday kits are out in stores, urging you to get dressed up and put on a glam face, I thought I’d join the club. I have been a holiday beauty kit shopping fiend lately! At the Sephora Friends & Family sale last month, I picked up the Bare Escentuals Putting on the Glitz Kit, and I’m happy I did. This is a lovely kit, very subtle but sparkly and festive. This kit is a Sephora exclusive, and might remind you a bit of last year’s Shimmer and Shine. It contains 10 pieces, for $54. That right there is a deal, but I nabbed it at 20% off, making it less than $5 per piece. Prime Time Primer Shadow in Toasted Almond (iced coffee). This primer is just a teesy tiny bit away from the Champagne Toast, another personal favorite of mine. It is just a tad darker and is a fantastic all over eye color, as well as a primer. Gorgeous blush (petunia pink) – a big POP of pink! Luxe Radiance AOFC (apricot pink) – this is a bit too pink to be an AOFC for me but makes an excellent blush. If you mix this with Gorgeous you get a baby pink that makes you glow. You also get a mascara, a Cheek & eye brush and a clutch. Included are an eyeliner and pretty amazing as well. The jury is still out on the Round the Clock Eyeliners for me - they are better than the B&B liners, which just slide off my face in a hot mess, but they aren’t as holy grail to me as Tarte or Urban Decay. I like the new Pretty Amazing lipgloss, which is a full color gloss as well; this is a pale shimmering pink. I love BlogHer. BlogHer is a network of women writers, bloggers, and readers, that focuses on empowering us to build a community around what we read, write, and talk about every day. As a BlogHer reader, and also a member I occasionally get access to review products, but I also get access to read about other people reviewing products. Sometimes these are sponsored, but most often is the best women writer search engine out there! By searching in BlogHer for “Bare Escentuals Ready”, I cam across a promotion that several bloggers are running, in which you can enter to win a Ready Duo. Since I am working on building my collection, I am writing about this amazing opportunity to win a duo! Several bloggers are participating, and you can enter to win too! Part of the fun of this contest is that I get to find new bloggers to add to my list of must reads, but also, community in blogging. BlogHer allows me to network, learn, and…hopefully win! Tis the Season for Friends & Family! It seems that this is the season to stock up on your favorite beauty brands! Right now, there are several sales going on, with several more coming up. 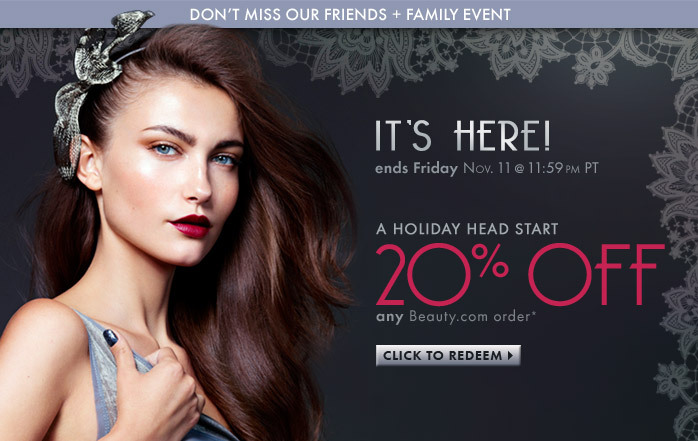 For Sephora VIBs, there is 20% off November 10-14th using code VIBDREAM (15% for BI’s). Don’t forget to use Ebates to earn an additional 4% cash back! I hauled recently at the Friends & Family sale, but there are a few things I might snag. After all, you have to earn those VIB points to keep your status! Sephora is also offering a Holiday Prep Kit gift with any $25 purchase (Beauty Insiders only). You can choose from a Smoky Eye, Flawless Foundation, Beautiful Skin, or Fragrance Sampler! It appears to be online only, which will probably prompt me to pick up my VIB sale items online instead of in store. Benefit Cosmetics is having a 20% F&F Sale with the code LOVEYALL. I’m happy to say that there are NO parabens in Benefit products! I love the They’re Real mascara, and the Creaseless Cream shadows. I will be picking up Watt’s Up as well! Beauty.com is having a 20% sale until Friday. Use this link to automatically get your discount at checkout. I love Beauty.com because you earn Drugstore Dollars with every order! Don’t forget to use Ebates to earn an additional 6% cash back! There are a huge number of beauty products on Beauty.com. I will be picking up some Bare Escentuals kits that are department store only I think, since those won’t get discounted for a long time. Get that ipod out, the playlist is ready! Ahh fall is here; it’s cold in the morning, gets dark before 7pm, and…it’s 75? Yep, that’s right – Indian Summer is in full swing here in San Francisco. That said, I’m excited about some of the Bare Escentuals special holiday collections. There are two 8.0 Ready palettes (eight pan collections) in this season’s gold compacts, which were released earlier this mornth. The pretty little palettes are a fun way to carry a great collection of color with you, including a brush and sponge tip applicator, for $40. I love this compact! There are endless combinations you can make with the colors; there are at least 2 highlighter shades, and you can do much more than the 4 coor combinations listed on the BE site.. The shadows themselves are creamy, with excelelnt staying power. They go on like a cream, but react like a powder. When I did not wear primer on this day, I found that the shadows lasted at least 6 hours on their own with out tocuhups. Add a little primer, and they will last all day. At first glace, I was unsure of this palette becuase the colors are quite bold But, as with any Ready shadow, you really need a VERY light touch when applying them. Don’t swipe yoru brush, just lightly dab it in the color. The amount of product will be plenty. You can always layer more on if you need it! I added the 10pm Round the Clock liner from the Bare Luxurry TSV, and Tarte’s Gifted Mascara. I have to say I’m a bit dissapointed with the Round the Clock, as it ended up on my lower lids, travelled and smudged, after just a few hours. I will continue playing iwth them, but for now, I’lll stick with other waterproof liners for these baby blues. The Playlist delivers all that and then some, and if you have any BE punch cards, be sure to use your discounts to make this a very affordable addition to your collection. The shadows will last you a long time and you can use any other Ready palette or your favorite loose minerals to blend with these colors. I also purcheased The Cocktail Hour, which is a smoky purple palete, and I can see myself combining these two soon! As I previously mentioned, the Bare Escentuals Today’s Special Value for November 18th is a gorgeous kit which contains a new exclusive Ready Duo. I received mine over the weekend, and was able to wear it yesterday. This Bare Luxury kit contains a TON of stuff for the price, and the biggest challenge is deciding what to wear! The Ready Duo in The Phenomenon is a great pair, with Golden Iris being a deep amber with a touch of shimmer, and the Azure Irish being a rich lavender. These were both created specifically to show off my baby blues, and the amber makes them sparkle. As with all of the Ready shadows, they are creamy and densely pigmented. While I wore a primer, I have tried them without primers and they last over 8 hours with minimal movement. The Round the Clock Waterproof Eyeliners are a new launch for Bare Escentauls, and one that I in particular and very excited for. I have been unable to wear their B&B pencil liners int he past because they turn me in to a racoon. These glide on easily and stay put for the most part. I am a bit disappointed that I did have some travelling by the end of the day, but they are excellent formulations that you can sharpen as you use the pencil up. The 10pm is a deep mocha shade, and the Noon is a rich Navy. The Marvelous Moxie glosses are something of a cross between Buxoms and 100% Natual lipglosses. While I am not a fan of the 100% Natural, I am a Buxom addict and these are a great addition. There is a slightly less intense tingle in these plumpers, and a nice vanilla scent. The Daredevil is perfect for fall, in a rich berry color. The Wild One is a light peach perfect for day time. Also included in this kit is the etheral Rose Gold Radiance. It’s lighter than a blush, and darker than most radiances, so it makes a very pretty heavenly brush. Rounding out the kit, the holiday brushes with gold handles are softer than most BE brushes in my opinion, and make a nice addition to your sparkle hoard. They are made to go with the other holiday brush kits seamlessly. I absolutely love this kit, and can imagine a ton of looks with it. The ready shadows are bold, but the Golden Iris color can be a very simple day look, or you can punch it up a bit. This will probably be one of my go to colors for a while. The preview ordering is still up, so don’t miss out on this great kit! For $68, you get a duo, 2 liners, 2 glosses, and 2 brushes. Plus, new collections seasonally. The kit will be presented on air on November 18th, and I look forward to watching how Leslie & Jessica use the kit, since it always provides me with inspiration.